Our firm is made up of some of the most effective, respected and accomplished legal minds in the country. Read about our legal team, and connect with us if you need a firm that is highly qualified and has a record of successful claims, lawsuits and appeals. 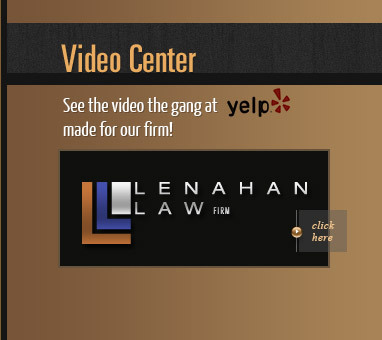 Marc Lenahan , the firm's founder and owner, is the best-reviewed personal injury lawyer in the State of Texas on Avvo, as noted by the Advertising Review Committee of the State Bar, as well as having achieved many other honors and service, including being the President-elect of the National Crime Victim Bar Association, and formerly serving as the president of the Texas Brain Injury Alliance, and listed in Super Lawyers® from 2009 to the present, and rated as a Top 100 Trial Lawyer since 2007, and a lifetime member of the exclusive Multi-Million Dollar Advocates Forum®. He is admitted to practice in both Texas and North Dakota, and has represented the injured in complex cases involving workplace accidents and wrongful death and has achieved many notable victories. M. Nathan Barbera , the litigation partner at the firm brings some unusual qualifications to the firm that have proven to be extremely valuable in achieving results. He formerly served as an insurance company defense lawyer, and he has extensive insight into the processes that insurance companies engage in when attempting to avoid paying injury claims. This former service allows the firm to predict the actions that will be taken by an insurance company and to craft a strategy to counter any attempt to avoid paying fair and full compensation, as deserved. P. Wes Black, the appellate law partner at our firm, is Board Certified in Civil Appellate Law. Appeals are a completely different legal process, requiring extensive research, and many law firms won't touch these appeals due to the complexity and intensity of the legal work involved. Wes also has a background serving at the Waco Court of Appeals and working for a prominent insurance defense law firm, and brings outstanding qualifications and legal skills to the team at the Lenahan Law Firm. The legal team at the firm operates together to craft a case that is geared to get results for the injured families who have lost a loved one in a tragic accident. Our experience, knowledge, commitment and the limited number of cases we take on are all important in our ability to achieve impressive case results. Call us today for more information about our firm.